The above info came from lioness and atomofish, and was edited by yours truly (contact me). The image came from Amazon.com. Kodomo no Omocha (or Kodocha for short) is a sugar high captured in animation, for the most part. Sana Kurata, the main character, is an 11 year old actress who may not be the brightest bulb in the box, but she genuinely cares about everyone around her and wants the world to be happy. The anime revolves around her world, from her demon-boy classmate Akito Hayama and her love-hate relationship with him to her acting career and the places it takes her (to America once, of all places!). The anime has a very lighthearted, energetic feel to it, but it does manage to touch on deep issues such as child abandonment, abuse and neglect issues, and even suicidal thoughts. Sana handles such issues in her own way, though, and the majority of the time Kodocha will cause you to laugh rather than to cry. The above description came from lioness, and was edited by yours truly (contact me). 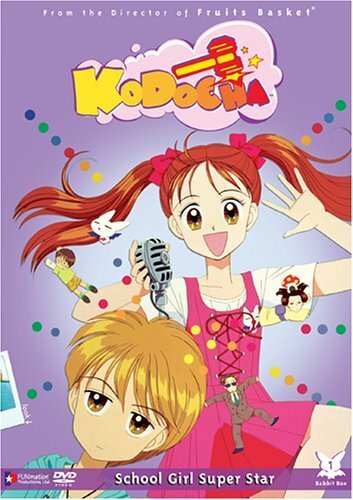 Kodocha tells the story of cheerful and hyperactive Sana Kurata, who is a famous child star of the hit Comedy show "Child's Toy" and her mother is also a famous award-winning writer. It seems like Sana doesn't have a care in the world. At least until he meets a boy named Akito Hayama.